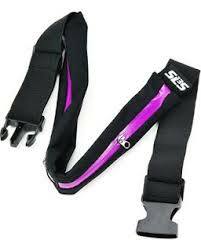 This week I tried out the SLS3 Dual Pocket Running Belt. (Full Disclosure: I won this belt as part of a giveaway on PGHLauren’s blog. However, this review and the opinions set forth herein are solely my own). While I have used running belts before (especially during marathon training) the options that I have run with have usually been fairly small (and therefore hard to comfortably fit certain items into). What initially drew me to the SLS3 running belt is that it has the same slim profile as my normal running belt, but with two pockets instead of just one. For a pack rat like me (you should see my purse) more space isn’t always necessarily a good thing. However, my current running belt barely zips just trying to fit my iPhone (not even the 6+) and a few gels. I ran with the belt for both of my longer runs this week. Since finding out I was pregnant I have been trying to make a conscious effort to start carrying my phone with me. I found that in the SLS3 my phone fit much more comfortably. During my run on Saturday I ran with a group of people and barely noticed that it was there. However, on Sunday I found myself much more aware of the belt as I ran and it didn’t seem to fit quite as well as it had the day before (I am not sure if it was because I was more distracted on Saturday or if my outer layer was thicker). However, after making a few minor adjustments I was able to get it to fit fairly comfortably. On both days I only carried my phone and my key (only utilizing one of the pockets). I did not experience any chafing from the belt and only noticed minimal bouncing. A few times the belt did seem slightly uneven (due to only using one pocket) and I ended up wearing it “crooked” to keep my phone in the small of my back. Overall, I would recommend this product for those who are seeking a fairly minimalist way to carry a number of running essentials with them on the run. For my own purposes, I am curious as to whether the water resistant running belt with smart phone pocket would be a better option for me (since I am really only looking to carry my phone and additional small items such as a key or a gu pack). However, I can definitely assure you that despite the few small items I noted, I will continue using this belt for my long runs. Do you use a running belt? If so, what kind? If not, what have you found works best for you? Looking to try something new? Check out the Try Out Thursdays Link-Up hosted by Running with SD MOM!